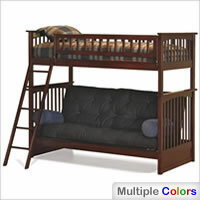 A futon bunk bed combines a futon -- also referred to as a sofa bed convertible or a casual sleeper -- with a regular bed (usually twin size) stacked on top of it. 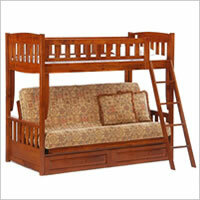 The top bunk is most of the time used as a primary sleeping area, while the Western style futon sofa on the bottom serves as a leisure time section -- but can usually turn into a double size bed in a few seconds if needed. 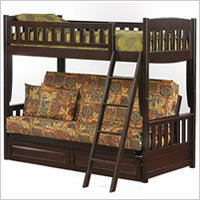 Futon bunkbeds are highly appreciated for their versatility and are equally at home in shared or single occupant bedrooms. 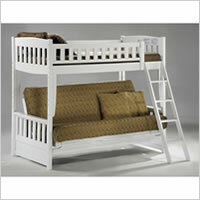 Young single people living in small apartments love them. 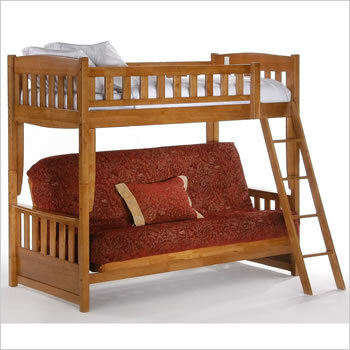 Parents often choose this configuration if their kids have lots of sleepovers; the young ones can use the futon as a sofa for lounging or reading or playing during the day and quickly turn it into a full size bed when it's time for sleep. 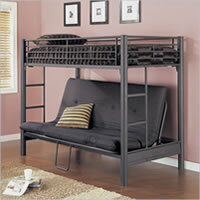 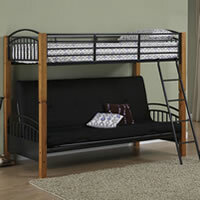 Futon bunk beds are available in many different styles and finishes, from traditional, missionary forms -- usually made of wood -- to more contemporary designs that often use metal as a primary material. 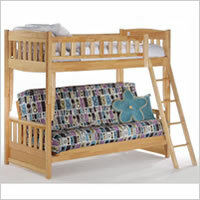 Featured here is the Cinnamon Twin/Futon Bunk Bed in Oak; Night and Day Furniture is the fastest growing futon seller in America and they implement some pretty nifty innovative solutions into all their futons -- so be sure to check them out.